From Pepin, WI, it takes less than two hours to reach Burr Oak, IA. If you’re unfamiliar with the name, it’s because Laura Ingalls Wilder did not include this period in her famous books. The site, however, is well worth a visit. Early photo of the hotel, Laura Ingalls Wilder Park and Museum. Laura Ingalls Wilder Park and Museum. Burr Oak had once been a bustling town, but its heyday had passed. Hard times continued after the Ingalls family moved into the hotel. “Ma was always tired; Pa was always busy,” wrote Laura. Caroline and Charles Ingalls didn’t like the rough men frequenting the saloon next door. They also had some conflict with the Steadmans. After a few months they moved out of the hotel. Charles took what jobs he could find, but money remained tight. “I knew that Pa and Ma were troubled,” Laura wrote. “I knew we needed money, and besides Pa was restless.” The family left town in the middle of the night. Laura’s daughter Rose Wilder Lane visited Burr Oak in 1932. Decades later residents wrote to Laura, asking for confirmation of her time there. There was some confusion about which structure had actually been the hotel, but in 1973, local residents purchased the Masters Hotel—now vacant, and in poor condition—and began raising funds for restoration. The building in this photo, on exhibit at the Laura Ingalls Wilder Park and Museum, is almost unrecognizable as the Masters Hotel. The historic site opened in 1976. Laura fans are very fortunate that the Masters Hotel—the only childhood home of Laura Ingalls Wilder that remains on its original site—has been saved. The hotel, built into the side of a hill, is larger than it appears from the front. 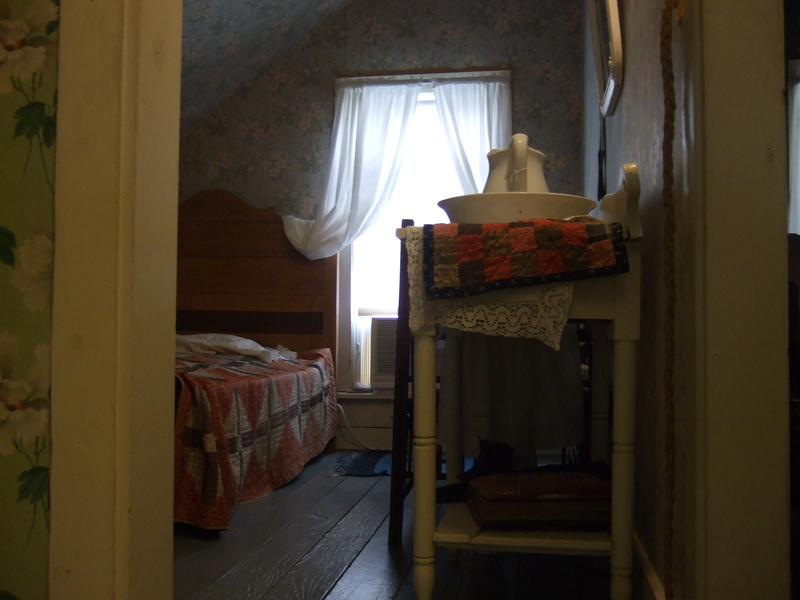 On the first floor, a variety of exhibits help tell the Ingalls’ story. If you’ve read Death on the Prairie, the 6th Chloe Ellefson mystery, you’ll particularly enjoy seeing this quilt block. (The director showed them) three beautifully embroidered handkerchiefs, carefully preserved beneath glass. “Ooh.” Chloe reached toward the glass, almost touching it. She wanted badly to sense something of Laura. She longed to know that Laura had been OK here despite serving food and scrubbing dishes. 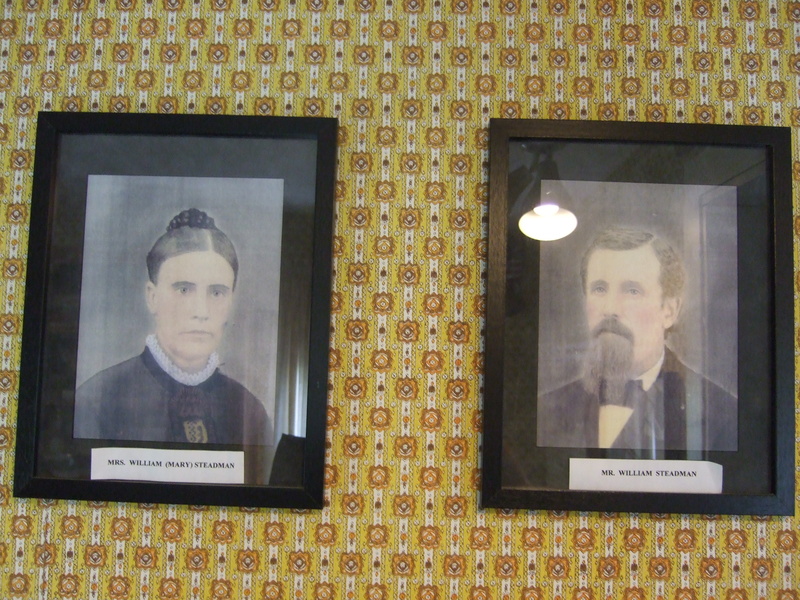 All other items displayed in the Master Hotel are from the period, but not original to the Ingalls family. On the hotel’s top floor, guests can visit the boarders’ rooms, where young Laura made beds. …where Laura and her sister Mary helped cook, wait on tables and wash dishes. 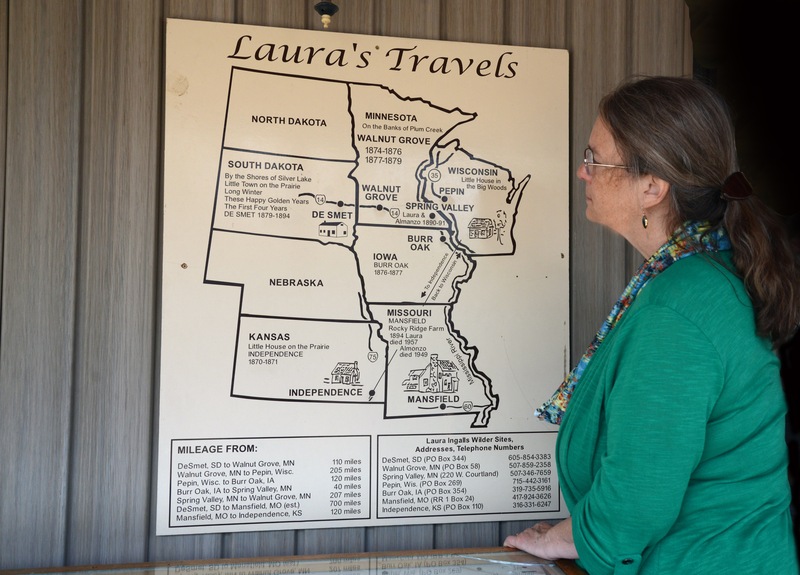 The Laura Ingalls Wilder Park and Museum welcomes guests in summer and fall. Purchase tickets in the building across the street, which also contains a small shop. After touring the hotel, take some time to imagine Laura’s happier moments in Burr Oak. She wrote, “When our school and work were done we played out by the pond.” Silver Creek still flows behind the hotel. From there it’s a short walk to the Burr Oak Cemetery, where Laura loved to wander. The cemetery, which Laura described as “a beautiful place,” is also site of a key scene in Death on the Prairie. When I visit Burr Oak, I love watching families explore the site—especially the children. Schoolchildren helped raise fund for the restoration by holding “Pennies for Laura” drives. “This building belongs to the children,” one guide told me. Laura would probably like that sentiment. And, Chloe fans should note that Burr Oak is only 12 miles from Decorah, IA, setting for Heritage of Darkness. Have fun exploring this lovely area! A strong sense of place is an essential element of Laura Ingalls Wilder’s classic books. Thematically, the series is all about place—finding a place to call home. Laura excelled at evoking her settings for readers. Yes, I know her books were edited by her daughter Rose. But some of Laura’s original, unedited writing is rich with vivid detail. I suspect that her descriptive skills were honed after her sister Mary went blind. Kansas prairie at Little House On The Prairie Museum. Plums growing by Plum Creek. One day I’ll catch them when they’re ripe. After several false starts, I finally found Silver Lake, on the outskirts of DeSmet, SD. Laura did not include the family’s time in Burr Oak, IA, in her classic canon. 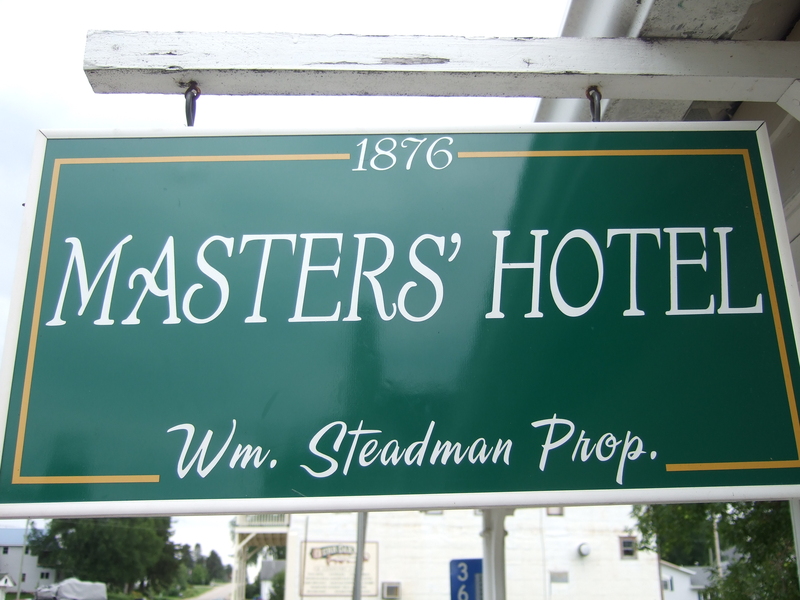 However, the Masters Hotel is the Laura’s only childhood home that remains on its original site, and is well worth a visit. I am in awe, actually, of how hard many people have worked to provide a special experience for those who come looking for Laura. 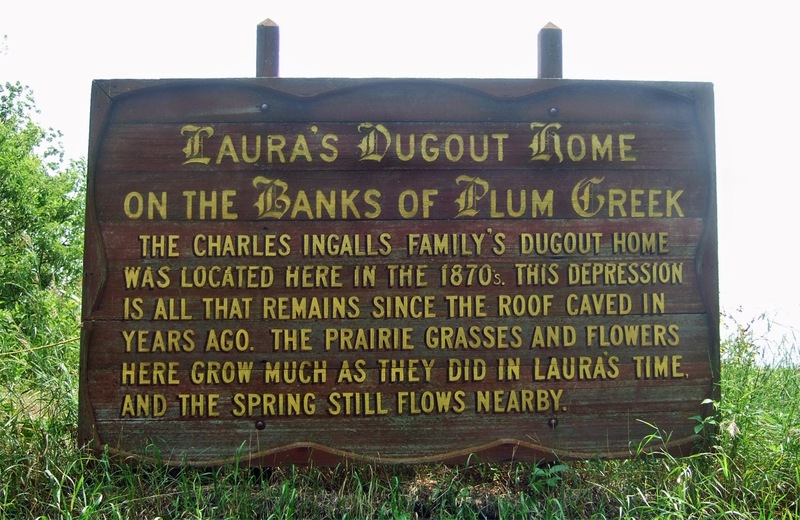 One of my own favorite Laura stops is the Dugout Site in Walnut Grove, MN. When Garth Williams was hired to illustrate new editions of the books, he searched for–and found—a depression that marked the spot along Plum Creek where the Ingalls family lived. As I’ve heard the story, the farm family which owned the property was surprised when Mr. Williams knocked on their door and explained his discovery. Since then, the family has made the site accessible to visitors. 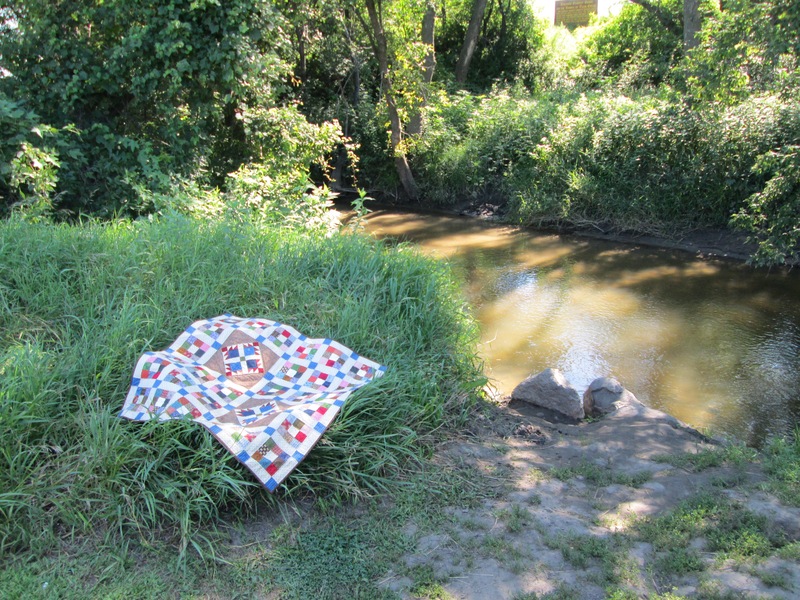 Laura and Mary worked on their quilt blocks in On The Banks Of Plum Creek. When Linda Halpin made me a (gorgeous!) quilt featuring the blocks mentioned in Laura’s books (and in my mystery Death on the Prairie), we felt compelled to photograph it at the Dugout Site. Something similar happened at the Kansas homesite, which was identified much more recently. Laura fans owe these generous people a debt of gratitude. Prairie restoration, Little House on the Prairie Museum, KS. It would be easier to fund a single, central Laura Ingalls Wilder museum, but that would never do. We want to experience the landscape for ourselves. There is also something powerful about walking the ground where Laura and her family walked. 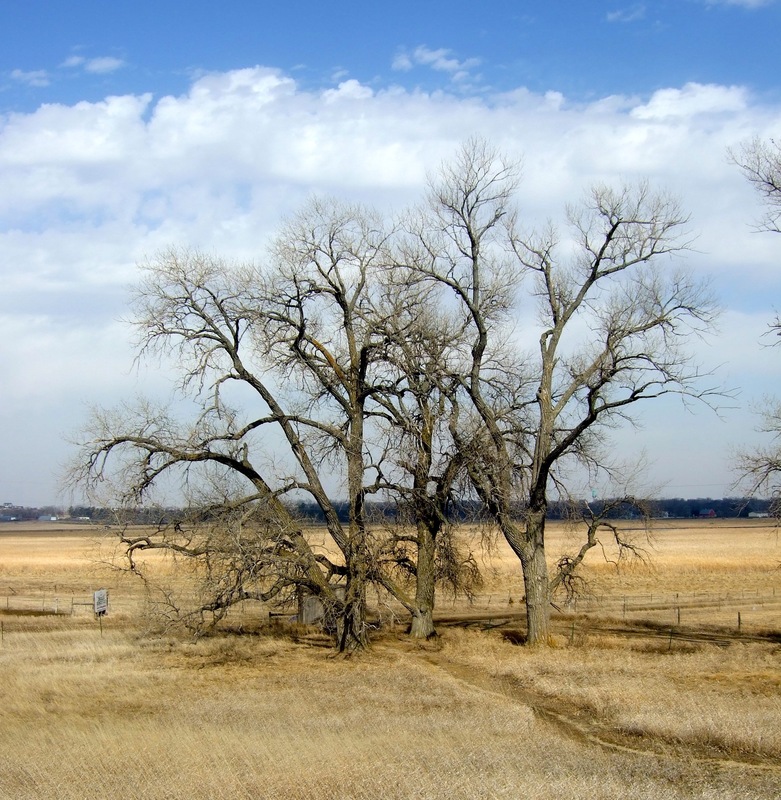 Ingall Family’s Cottonwood Trees, near DeSmet, SD. 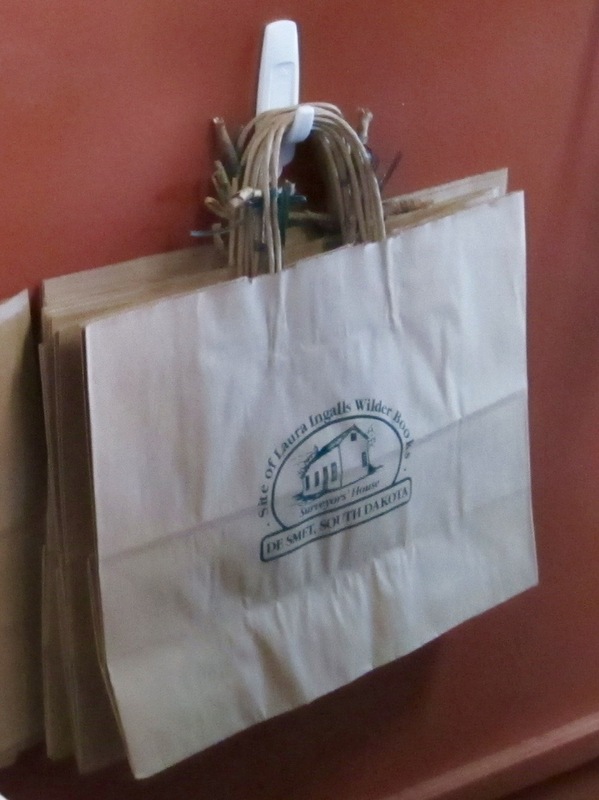 I love this – make a purchase at the Laura Ingalls Wilder Historic Homes gift shop in De Smet, and your bag will be adorned with a twig gathered from downed sticks in the cottonwood grove. When I began planning Death on the Prairie, the 6th Chloe Ellefson mystery, I knew I needed to get Chloe on the road. Chloe and her sister Kari had long dreamed of making the tour, and the need to authenticate a newly discovered quilt once owned by Laura spurs the sisters to visit the primary Laura homesites. For those readers who savor armchair travel, I’ll be posting about each place in the coming weeks. If you’ve visited the sites, I hope you’ll share some memories! After a month of tornado cleanup, Old World Wisconsin opened its gates last weekend. 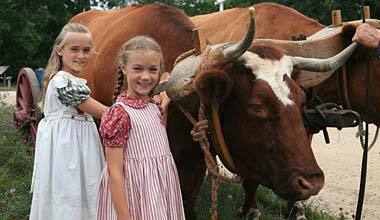 The grand re-opening celebration coincided with one of the historic site’s special events, Laura Ingalls Wilder Day. 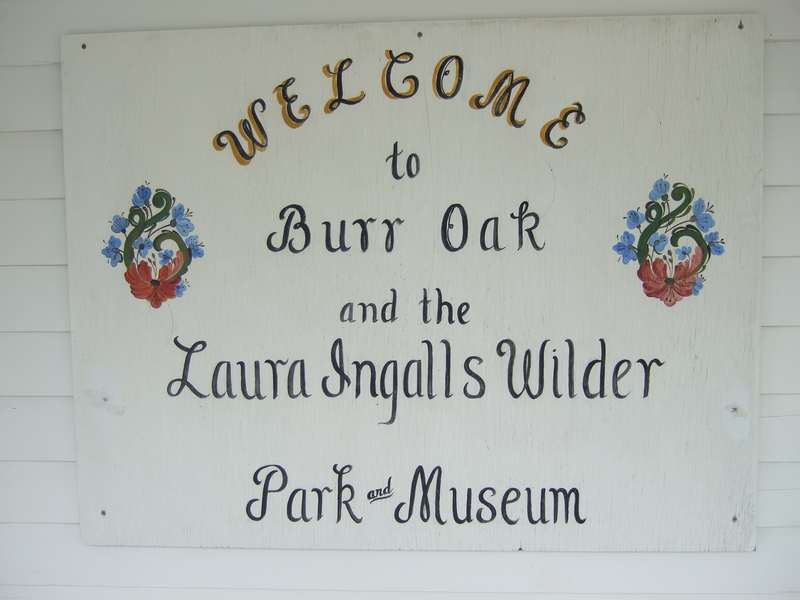 I’ve been thinking about Laura myself lately because while traveling in Iowa last week, I visited the Laura Ingalls Wilder Park and Museum in Burr Oak. It was a site, and a chapter in Laura’s life, I knew nothing about. The only one of Laura's childhood homes still on its original site. The Ingalls family moved here in 1876, when Laura was nine. Anyone who has read the Little House series knows that Laura’s family moved frequently when she was young—sometimes looking for new opportunities, sometimes leaving behind some misfortune. The family had been farming in southern Minnesota when clouds of grasshoppers descended, destroying every plant and ruining every farm in their path. 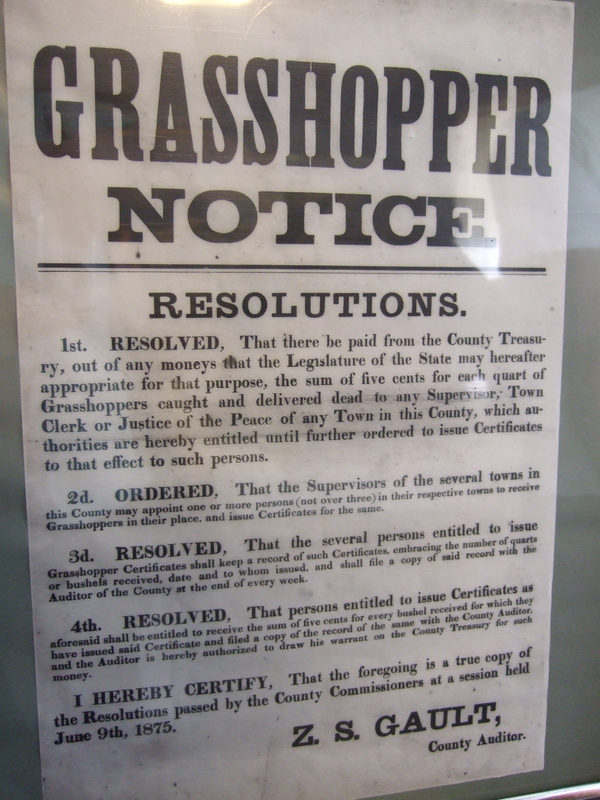 This poster offered a bounty for dead grasshoppers. Officials hoped that the pennies earned would help farm families buy food, and perhaps keep them from moving on. 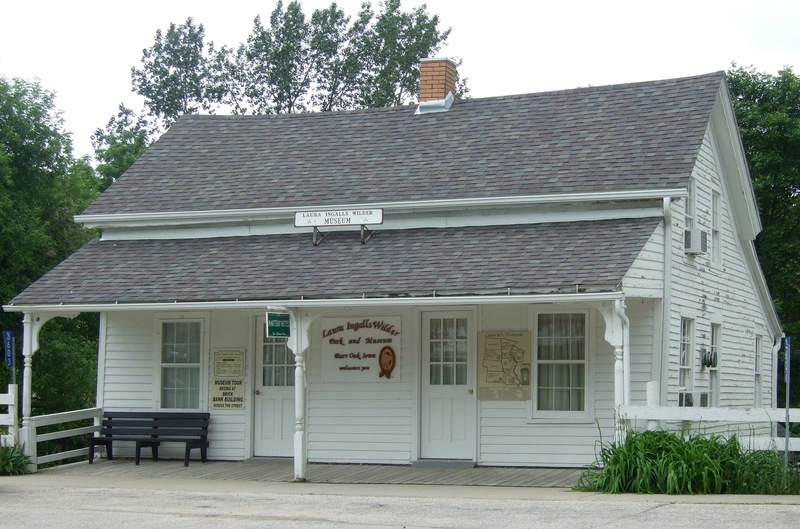 Mary and William Steadman, friends of the Ingalls’, decided to buy a small hotel in Burr Oak, in northeastern Iowa. They invited the Ingalls family to help manage the hotel. Desperate, Charles and Caroline Ingalls agreed. Mary and William Steadman attended the same church as the Ingalls. The Ingalls family experienced tragedy before even reaching Iowa. While visiting family along the way, baby Freddie, who was nine months old, died suddenly. We can only imagine the mood as Mary, Laura, Carrie, and their parents traveled the rest of the way. Upon arrival, they moved into a single room in the basement level of the small three-story hotel. The hotel, restored to its 1876 appearance. The prospects for financial prosperity were dubious. 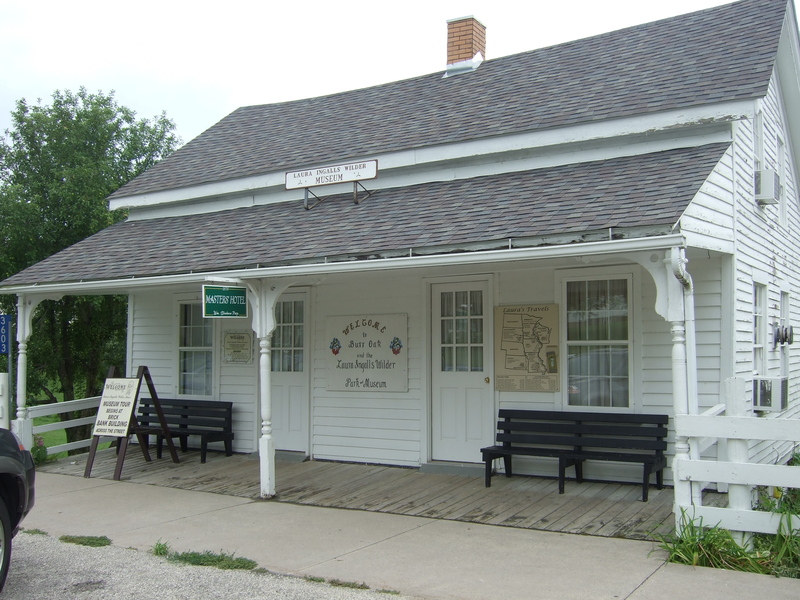 The railroad had bypassed Burr Oak, which remained largely a service center for local farmers. Travelers and permanent boarders took lodging for twenty-five cents. A meal was an additional quarter. One of several bedrooms in the hotel. The girls were able to attend school, and made friends. Mary and Laura also helped with chores around the hotel—cleaning rooms, perhaps, as well as waiting tables and washing dishes in the lower-level kitchen and dining area. 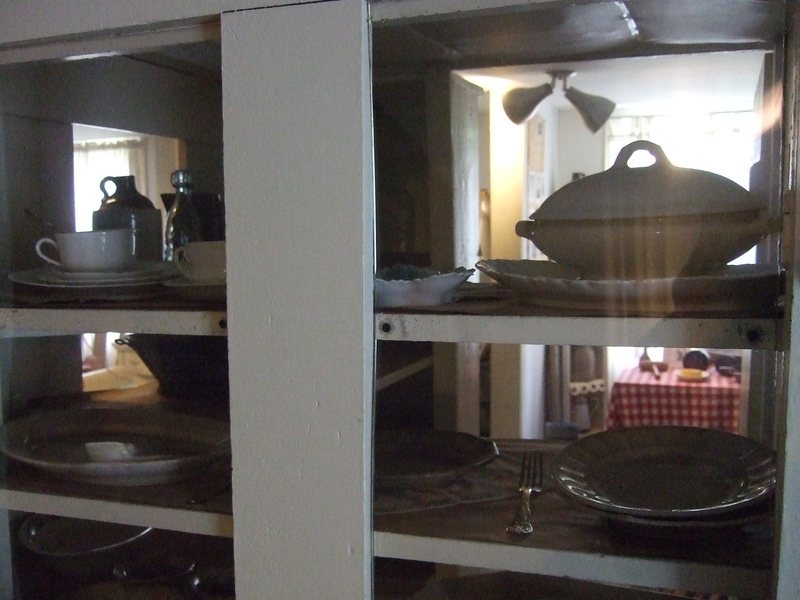 The pantry where the two oldest Ingalls girls helped at mealtime. But Charles and Caroline Ingalls were concerned about having their children in close proximity to some of the men who frequented the barroom upstairs. Drunks started domestic disputes, used foul language, and shot holes in the door. 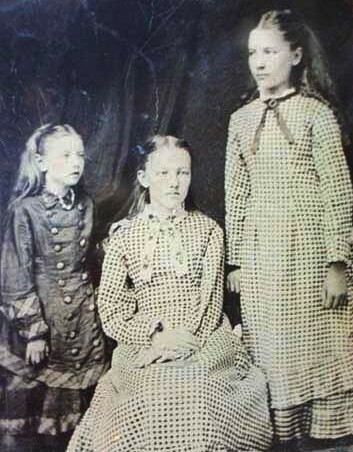 Carrie, Mary, and Laura Ingalls. The family moved out of the hotel and into a small house before the next child, Grace, was born in 1877. But despite Charles taking whatever odd jobs he could find, the Ingalls’ financial situation had not improved. It was time to move on. I hope the children who visited Old World last weekend had fun, and learned some new skills. I also hope that the families in attendance paused to think more about those larger themes in the Little House books. The characters celebrate the importance of family and friends. They demonstrate tenacity and optimism. And they remind us of the need to accept change with whatever grace can be mustered.